It's time to change the clocks - "Spring Ahead" into daylight savings time! That means that spring really is just around the corner with flowers ready to burst out with color. Here are some of our crocuses before the (very small) snowstorm we had this week. After the snow, we had some interesting visitors near the pond...Snow Geese! These birds have a special call that is unmistakable. Here you can see them in the snow with some of the Canadian variety nearby. 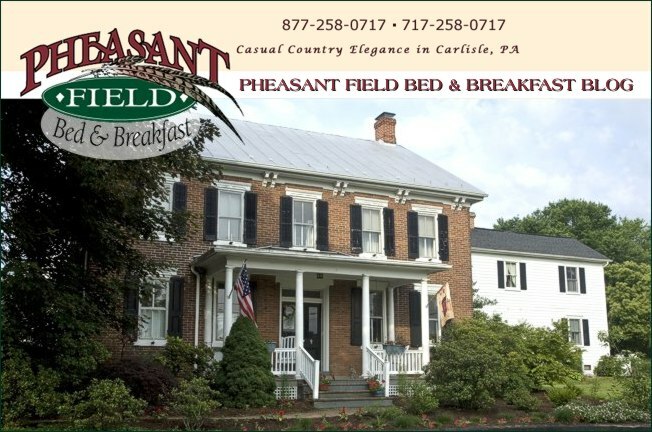 The daffodils will be blooming soon so it's time for a spring getaway to Pheasant Field B&B. Meadowbrooke Gourds will be having their Spring Open House next weekend. They have lots of cute bunny gourds and egg gourds to get you into the springy feeling. Ashcombe Farm & Greenhouses will hold a seminar on pruning your perennials on March 23rd - just in time to get your garden growing right! March 31st also brings the end of voting for "Simply The Best" in Harrisburg Magazine. It takes quite an effort to make your ballot valid because you must complete at least 30 categories. We really appreciate your time in casting your ballot! Thank You! 1. Turn your clocks ahead one hour tonight! 3. Plan a springtime getaway now!